Come get a sneak peek of our contest set! Join us for Friends & Family night at 7pm at Christ the King Lutheran Church as we perform our two contest songs in full costume! A great way to hear us if you can't join us in Concord, NC next month! 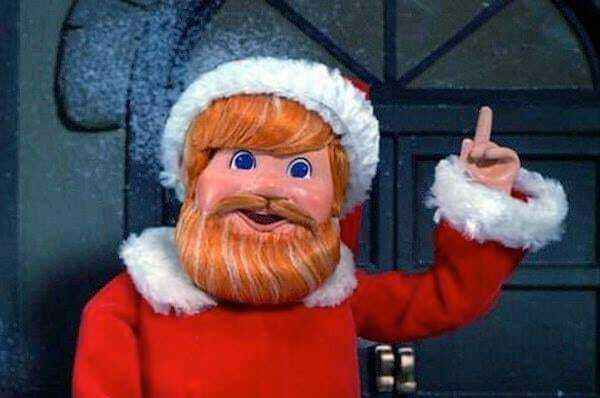 It's Kringle Cash Time Again! Kringle Cash is a fundraiser conducted in January by the chorus. For just $10, you can purchase a card that gives you 275 chances to win one of ten $50 prizes and the grand prize of $50! Drawings for the $50 prizes begin on January 7 and are held Monday, Wednesday, and Friday until the final drawing for $500 on January 30! Stay tuned to our Facebook, Instagram, and Twitter feeds for the announcement of winners as they are drawn. **POSTPONED!!! ** Join us for Guest Night! Rehearsal Moving to a New Night Soon! Exciting news! Effective July 12, rehearsal will be moving to THURSDAY nights! 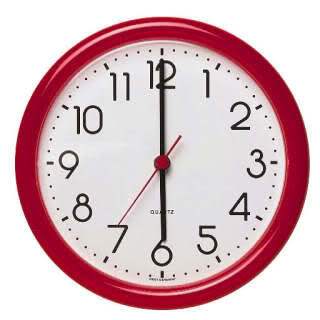 Same time (7pm), same location (Branch's Baptist Church), just a new night (Thursday)! If you were planning on coming out to visit us please make a note! We'd love to see you soon! Great big congratulations to our director Vera Crouse, for her recent achievement of Harmony 500 Director! The Education Direction Committee and International Board of Directors of Sweet Adelines International recently informed us that Vera has attained the high level of musical leadership in the Director Certification Program. 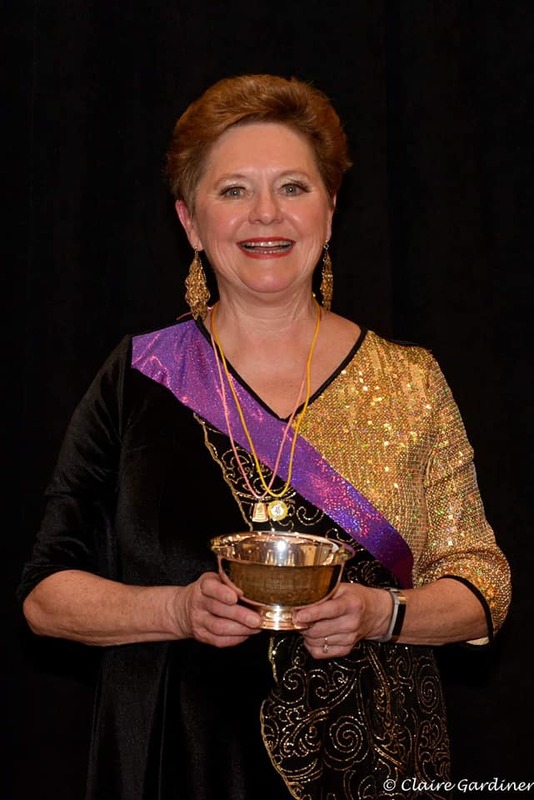 By virtue of the score received at the 2018 Region 14 International Division Chorus Competition, as well as previously completed requirements for the level of certified director, Vera has achieved the level of Harmony 500 director. We're so proud of Vera and her leadership of our chorus. We hope to get her to the next level when we hit the stage again next year! For the last few years, the Bass section of the Greater Richmond Chorus has organized a number of community service activities through a project they call Basses That Care. Every few months, they select a community project and collect donations from the entire chorus to support that cause. Most recently, they worked with The Coal Pit Learning Center, a Richmond-area preschool that is dedicated to building a nurturing and engaging learning environment for students from low-income families. The center was in dire need of supplies to support their students, ranging from paper products and snacks all the way to art supplies and toys. With contributions from the entire Greater Richmond Chorus, this project was a huge success! We were able to gather a full truck-load of supplies and deliver it all to The Coal Pit this week. We made a grand entrance in a decorated pick-up truck filled with goodies, pulling right up to the school. The children were so excited and the looks on their faces were priceless! They even helped us unload all the toys! There was singing by all (of course!) as we sang to the children and then they sang for us. A good time was had by adults and children alike! Thanks to the generosity of our chorus members, The Coal Pit now has its needs met for weeks to come. We were reminded that while it can sometimes take a village, often it just takes a few good people to reach out and help those in need. There’s nothing better than seeing a smile on the face of a child! To learn more about The Coal Pit Learning Center and see how you can help, visit their website at http://www.coalpitlearningcenter.com/. Send a Mother's Day Serenade! - Present a card with your very own message! Does your special lady live out of town? No problem! You can order a phone-a-gram! This is a great, affordable way to tell your loved one how much she means to you! Click the link below and scroll to the Delivery By Phone option for more information! 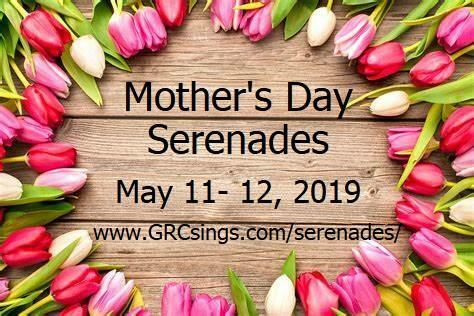 Give the gift of song this Mother's Day! It's Sweet Adelines International regional contest season! The Greater Richmond Chorus was pleased to perform at the Region 14-Heart of the Blue Ridge Contest and Convention the weekend of March 23, 2018. We had four quartets representing the chorus on Friday, including REV'L, Whirlwind, 3 Nice Girls, and Brazen Tarts. All performed beautifully, with REV'L bringing home second place medals as well as the Most Improved Quartet award! The chorus performed on Saturday, with 62 singers on the risers, placing us in the large chorus category. It was a competitve field with so many amazing choruses! We earned 5th place overall, bringing home green medals. We celebrated with an amazing chorus dinner and a fun afterglow, where we heard from many quartets who came to visit as they made their rounds to all the party rooms. Did you know that you can use Amazon Smile to help the chorus raise funds? Simply go to smile.amazon.com/ch/54-1059146 and Amazon donates to Greater Richmond Chorus of Sweet Adelines International! We'll automatically get a tiny percentage of each of your purchases! And, Amazon is TRIPLING the donation rate on your first smile.amazon.com purchase - through March 31! Get going and order something! 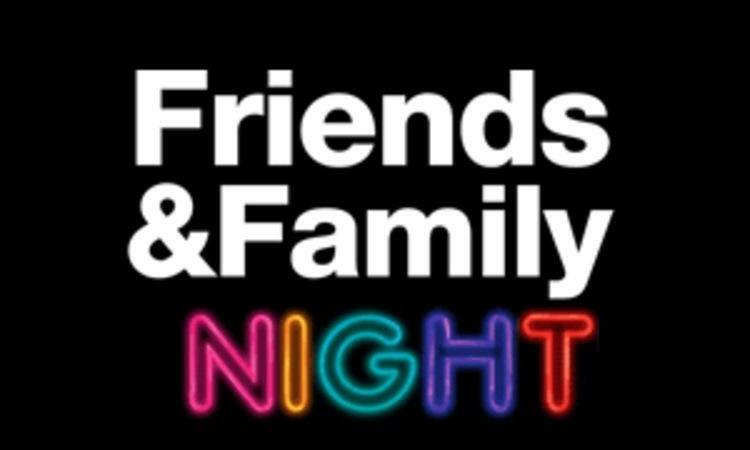 Come to our Friends and Family night on Sunday! We'll be unveiling our new costumes, doing a full dress-rehearsal of our contest set, and singing for those we love the most...YOU! You'll also get to hear from a couple of our quartets that will be competing at the upcoming regional contest as well! It's a FREE event, starting at 3pm at Branch's Baptist Church. On Monday, February 26, fourteen GRC members and five guests gathered at Sedona Taphouse in Glen Allen to support The Coal Pit Learning Center - and enjoy a delicious lunch! 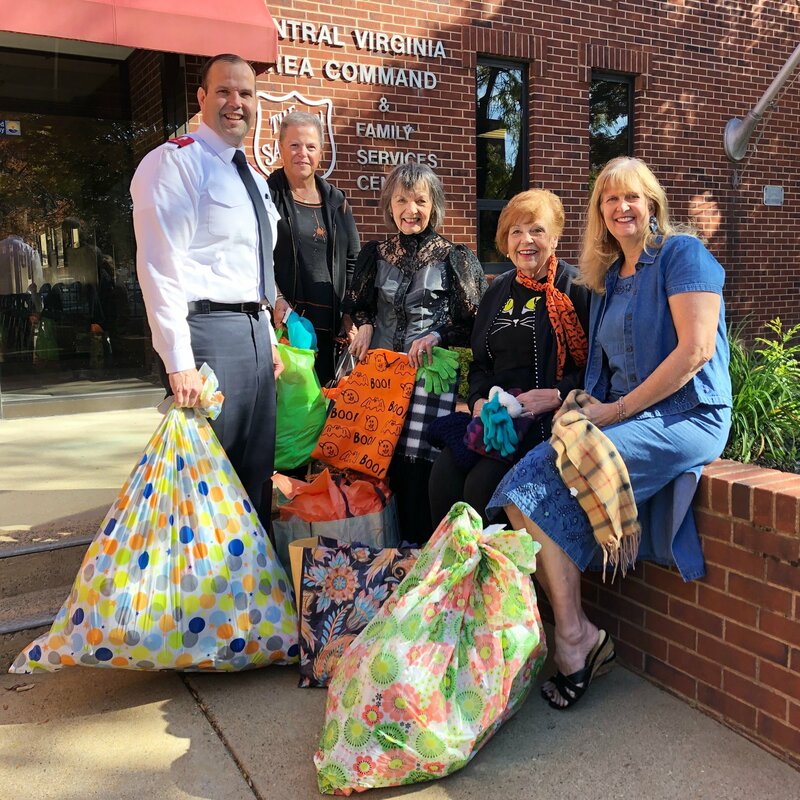 We heard about this wonderful pre-school that serves underprivileged children from GRC's good friend, Patty Kruszewski, Managing Editor of “The Henrico Citizen” and long-time friend of the learning center. Patty passionately shared a brief history of the learning center and it struck a chord with Sue Hannan, who's always ready to go to bat for a worthy cause with her "Basses That Care" projects. As a result of this luncheon, the ladies of GRC will be gathering a number of things from the program's Wish List to donate to the center! We've also been invited to personally deliver the items to the center and wrap the package with an extra special gift of song from GRC for the youngsters and staff. Of course, we couldn't pass up the opportunity to entertain so we sang a couple of songs to the roar of the crowd. Patty videoed us and will post it on the center's website soon! We had a wonderful time simply being together spreading harmony and joy in many different ways by helping others. Won't you be our guest? It's our February GUEST NIGHT! 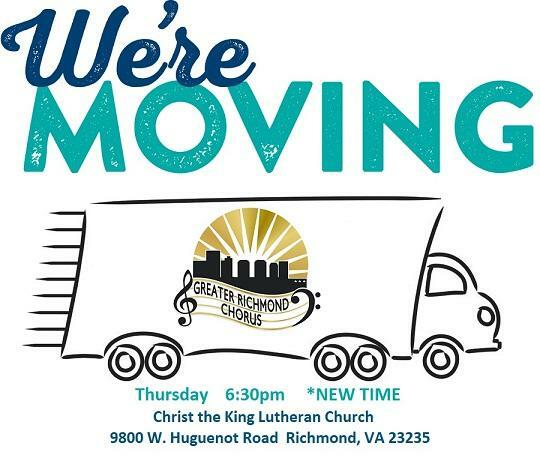 Come see what the Greater Richmond Chorus us all about! While guest are always welcome at our Monday night rehearsals, we also offer regular Guest Nights where it's all about YOU!! You'll get to sing a bit, play a bit, and socialize a bit! We'll even have snacks! Don't miss out! February 19 from 7-8:30pm Branch's Baptist Church. We're so excited we could burst into song! On February 6, we had a special coaching session with the amazing Sean Devine! He's the BHS Champion Lead of OC Times and Medalist Lead of Throwback, who performed at our show last autumn. We were certaily ready to absorb all he had to offer us, and he and Vera worked us over! It's so amazing to receive support from some of barbershop's most amazing performers! Just 7 weeks until our Regional contest and we'll be ready! WOW! Our annual chorus retreat in Virginia Beach was amazing! After being snowed out the past two years, we were glad to spend the weekend away from distractions, focusing on our contest set for the upcoming March Regional Convention. We were honored to have Joe Cerutti, one of barbershop's great performers and directors, as our coach for the weekend! Currently the director of the Alexandria Harmonizers, Joe is also the Director of Outreach for the Barbershop Harmony Society and was previously the director of the Sweet Adeline's chorus Pride of Baltimore. He is an outstanding director, choral judge, coach, and music educator as well as a dear friend of the chorus. We absorbed all that Joe had to offer us and are riding that motivational wave all the way to Concord in March! Congratulations to Donna Hagenbuch, the winner of the $500 Cringle Cash drawing! Click the Video Announcement link below to see the Management Team congratulate the winner! Thanks to all who participated in this fun event! This concludes our 2018 Cringle Cash Raffle series! Stay tuned to our Facebook page, Instagram and Twitter feeds for more exciting news in the coming weeks. The Winners Just Keep Coming! Last Friday's Cringle Cash winner was Rosemary Owen and yesterday's winner was Katie Smith! 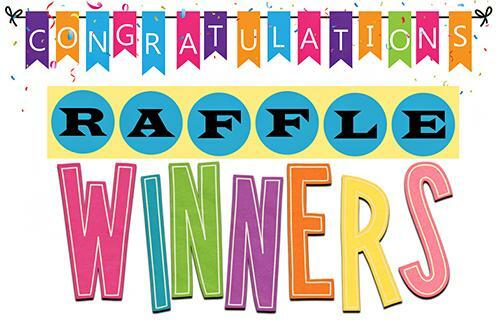 Congratulations to both ladies who will each receive $50 for the winning ticket! Remember that the drawings will continue every Monday, Wednesday, and Friday this month, with the final prize of $500 at the end of the month! Best of luck to all ticket holders! It's Winner Wednesday and today you get a two-fer! Our Cringle Cash winner for Monday was Sam Dougherty and today's winner was Tom Reichert! Congratulations to them both on their $50 winnings! Stay tuned! Drawings continue through January! It's the Friday drawing for our Cringle Cash fundraiser! Today's lucky winner.......Karen Herman! Your $50 is on the way, Karen! Remember, drawings are held every Monday, Wednesday, and Friday through January! Prizes are $50 each with the exception of the last drawing, which is $500! The winner for Cringle Cash drawing #2 is...[drumroll]... JULIA OLSEN! Your $50 is on the way! Remember: all winning tickets are put back into the hopper so you've always got a great chance to win! Stay tuned for our next drawing on Friday! First Drawing of Cringle Cash! The Cringle Cash drawings have begun! Here's a video of our Wendy conducting the first drawing! Today's lucky winner is Ben Brown!! Stay tuned every Monday, Wednesday, and Friday through January for announcements of the winners after each drawing! We'll post them here, on Instagram, and on our Facebook page! Want to win some cash to start the new year? The Greater Richmond Chorus is selling Cringle Cash raffle tickets! One $10 raffle card gives you 25 tickets in the raffle with 275 chances to win $50 prizes or the grand prize of $500! That would be an amazing way to start the new year! And, to make the deal even sweeter, winning tickets are re-entered into the drawing! Drawings will be held every Monday, Wednesday, and Friday beginning on January 1 (ten drawings in all for $50 cash prizes) and continue through until the grand prize drawing on January 24. To purchase your tickets, contact any chorus member or message us on Facebook! A great big THANK YOU to all our friends and family who came out to celebrate our 40th anniversary! Our Forty & Fabulous show was such an amazing event and a great way to honor our many years of harmony in the Richmond area. Our special guests, Throwback, wowed the crowd with their amazing harmonies and helped bring us back in time with some amazing songs. Our newest quartet, 3 Nice Girls, made their debut performance and knocked it out of the park! Crowd favorites Vocal Odyssey showed the audience how amazing it is to sing with your friends each and every week, while REV'L, second place medalists in Region 14, jazzed it up with a few great numbers. And, of course, the full chorus sang their hearts out with tons of new songs. It was a celebration that was not to be missed and we're so glad that we could share it with so many people! Even though the show is over, there's no rest for us! Next, we'll transition to Christmas/Holiday songs and then continue our contest preparation, which will include our chorus retreat in January, a number of coaching sessions this winter, and our contest weekend in the Spring. Interested in bringing some of this fun to YOUR next event? The chorus, a small ensemble, or one of our quartets are available for private engagements including parties, ceremonies, receptions, and events. We can customize the show for your event, space, and budget! Go to Contact > Book Us to learn more about bringing the Greater Richmond Chorus to you! 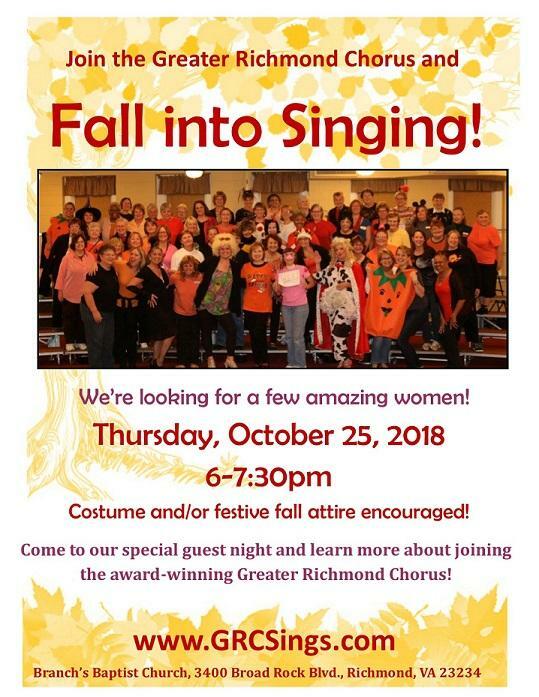 If you're interested in learning more about singing with the Greater Richmond Chorus, be sure to come to one of our Monday night rehearsals or guest nights! We'll post those dates in the Events section on our website. You can also email membership@grcsings.com for more details. The Greater Richmond Chorus is sad to share the news that we recently lost a beloved member of our singing family. Doris Gable was a long-time member of the chorus and always had a smile on her face! Here's a tribute to Doris from Donna, one of the many women who were lucky enough to get to know her! "What a joy and privilege it was to sing baritone next to Doris. She knew the part and she knew it well, so passing songs while standing next to her was never a problem. She enjoyed gardening, was an avid reader, working crossword puzzles and making her favorite pickles. Her advice to me was "don't get old, its no fun"
Doris, I'm glad we laughed, I am glad we loved, I'm glad we sang, oh how we sang." Join the Greater Richmond Chorus’ Forty & FABULOUS celebration! To celebrate our 40 years of bringing harmony to the Richmond area, we'll put on our sparkles and tune up our voices to put on an amazing show just for you! The performance will feature our guests Throwback, recipients of bronze medals in the 2015, 2016, and 2017 Barbershop Harmony Society International competition. They bring their love of yesterday’s music along with their championship-level performance to help us celebrate this amazing anniversary. Throwback joins the chorus as well as our featured quartets, including regional medalists REV’L, crown favorite Vocal Odyssey, and 3 Nice Girls, making their debut. Help us celebrate generations of amazing music and education in our community. This is going to be an amazing show that you won’t want to miss! 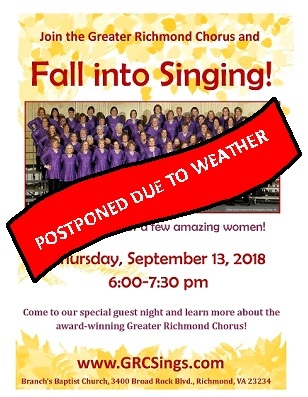 Tickets for the November 4 show at the VCU Singleton Center for the Performing Arts can be purchased here on our website or by contacting any chorus member. Henrico, VA 23296. Questions? Email us at events@grcsings.com. Come sing with us! 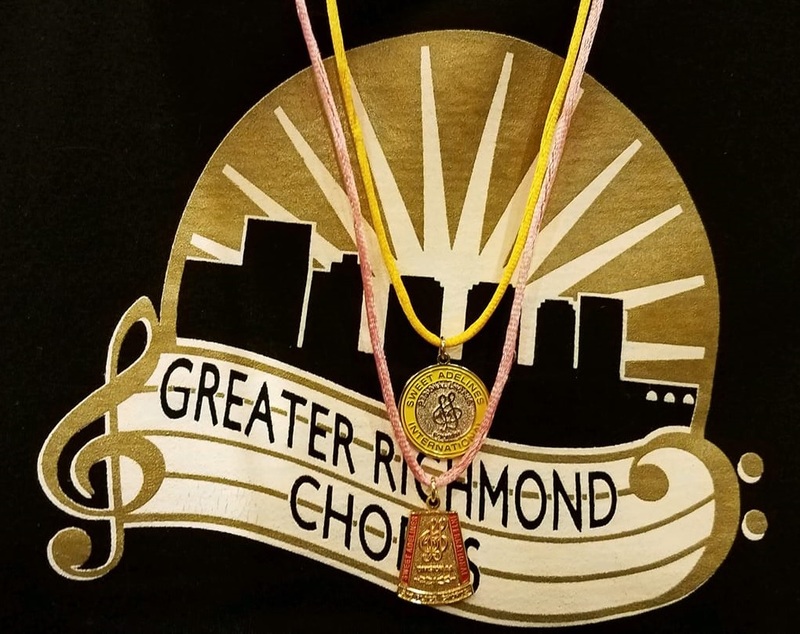 Learn more about the award-winning Greater Richmond Chorus through our Guest Night on September 25 at 7pm. Join us for some fun, friendship, and fall goodies! See the attached flyer for specific details or go to our Events calendar. We hope to see you there! We're celebrating our 40th anniversary with a new look and feel for our website! Our new site includes new sections, a clean design, an updated Events calendar, and new places to show off all of our pictures! Watch for more updates in the coming weeks, In the meantime, be sure to check out all the new information by using the links at the top of the page. Vera Wins on the International Stage! We’re so proud of our director, Vera Crouse, and her quartet Rendezvous for earning a second place medal during the 2017 Rising Star Quartet Contest! Held as a part of the weekend-long Sweet Adelines International Education Symposium in Baltimore, Rendezvous competed against 12 other quartets from all over the country. To be eligible to compete in this special contest, all members of the quartet must be under the age of 25 and perform a contest set consisting of two songs, one ballad and one uptune. Scoring followed the same guidelines as regional and international competitions. There were many GRC members and sisters from all over Region 14- Heart of the Blue Ridge in attendance to cheer them on in person, as well as many others rooting for them while watching the webcast. They even got to meet Deke Sharon! Congratulations to Vera and Rendezvous for an outstanding performance! The Greater Richmond Chorus is celebrating 40 years in the Richmond Community! Boy, have we seen a few things in that time! We'll be celebrating our anniversary with a special performance on November 4, 2017! Stay tuned for more information, including a special announcement regarding our guest quartet!